We are your local experts to call when you need an advanced cleaning service you can rely on. One that is carried out by qualified and dedicated professionals. Carpetsure specializes in the cleaning of carpets, rugs, upholstery, curtains, leather, hard floors and mattresses, serving in both the domestic and commercial fields. We are based in Poole, covering a large surrounding area and we are open for business 7 days a week. At Carpetsure we strive to bring you the safest, strongest and most effective cleaning solutions in the professional market. We have the experience and the equipment to surpass each customer’s expectations. 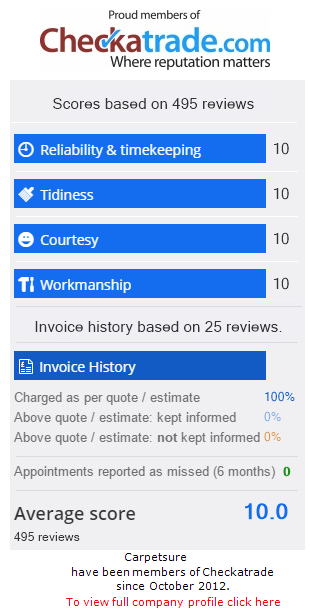 We are passionate about what we do; customer service always comes first that is why 70% of our work is from referrals. Our pricing is honest and simple with no hidden costs. We're confident you won't find a more thorough cleaning service, why not give us a call today?